The share price doubled in 2012. While PE ratios for the years between 2008 - 2011 were hovering between 12.22 and 13.00, PE for the year ended 2012 was increased to an astonishing 23.3 times!! Such drastic increase may mean changes of something more fundamental, otherwise just a fluctuation of market forces that we should take advantage of (means it is time to sell la). 1. The historical growth of EPS was normal (on the face of it, the growth number is lackluster. but we know there were RM12.7m disposal gain in 2011.) Growth of net dividend payout had been increased at 20% range year on year. 2. There is only one new store at Kulai expected to start in 2013. Two stores, Ipoh Station 18 and Seri Manjung that started in 2012, will have full 12 months earnings in 2013. 3. Taking into forecast profit growth consideration of 10% for Retailing, 25% for Property Management Services and 30% for interest income, my forecast EPS for year 2013 is RM0.72 per share (or 72 sen per share). Valuing at PE 13 times, the fair value of the share should be at RM9.36. 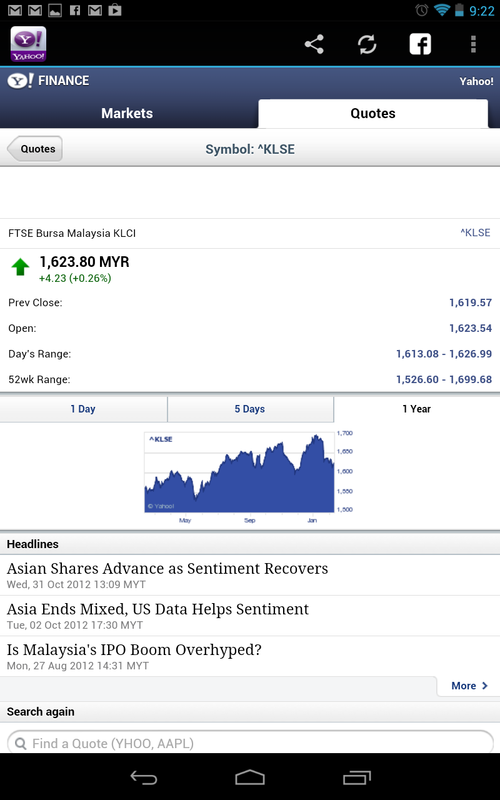 One research house gave a more positive outlook and higher valuation at RM11.82. Currently, the share price is RM17.64 at forecast PE of 24.5, which is ridiculously high. Unless there is something that we don't know, i.e. disposal of old land at revalued price, new interested investors, corporate finance activities to securitise the property and put them into REIT, etc. otherwise, I am avoiding to buy more into this stock. In the midst of worldwide currencies devaluation race, the safe haven is Singapore Dollar. Keep your money there. Countries from all over the world are devaluing their currency to save their economy. United States had been quietly devaluing US Dollar while blaming China of keeping Renminbi artificially low. UK, Japan, South Korea, Venezuela, etc. all had their currencies devalued recently.The devaluations can be intentional simply to gain competitive edge or just a side effect of monetary easing (i.e. lower interest rate, printing money into economy, loosen credit control, etc.) to boost economy. In response to the possible currency war, G20 government officials met to vow not to devalue currencies for economy benefits. When we invest in the stocks of a country, we will not want the denominating currency to devalue. So which country that we should invest in? In a world where most countries race to devalue their own currency in order to gain competitive advantage for the nation's economy, there is one tiny country that has little incentive to manipulate to keep their currency low. In another words, for this country, it is okay to allow their currency to grow higher without losing economy competitiveness. Higher currency value will still affect service sectors of this country, i.e. tourism, living expenses, etc. But this tiny little red dot country has one of the highest income per capita in the world and attracts all sort of investments and tourists from all over the world. There should be little problem with slow and steady growth of currency value. When the whole world tries to devalue their own nations' currency, this country is okay with its currency valuation or even allow it to grow in relation to other currencies. If I trade in forex, I would buy this currency for long term. This currency is Singapore Dollar. For value investing, especially on the dividend growth stocks that I am interested in, there are limited choices in Bursa Malaysia. While we can expect US dollar to drop further in relation to Ringgit Malaysia, we can expect Singapore Dollar to continue to raise against Ringgit Malaysia. This will provide extra investment gain from foreign exchange gain. The problems are how one can open an online trading account and bank account in Singapore? How one can source for quarterly report and annual financial results of companies listed at Singapore Stock Exchange? This is a journey that I decided to explore, step by step. If you are interesting in finding out how to open a Stock Trading Account in Singpore, follow this blog. I will update my progress here. For a start, there is a post in this forum providing useful and complete guide in setting up a Singapore Stock Trading account, or click here.